Antelope Canyon is a slot canyon formed by erosion found on the land of the Navajo nation, just east of Page, Arizona. Antelope Canyon is actually divided into two separate slot canyons, but the whole region is collectively referred to as Antelope Canyon. 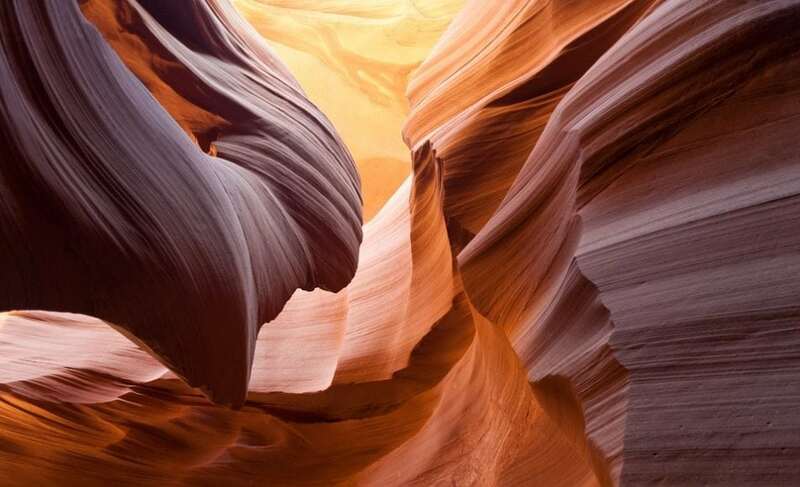 The upper part of the canyon is usually referred to as The Crack or just Upper Antelope Canyon, while the lower portion of the canyon is often called the Corkscrew or just Lower Antelope Canyon. The Navajo name for the lower portion of Antelope Canyon is Hasdestwazi, which translates as roughly “spiral rock arches”, while the Navajo name for the upper portion of the canyon is called Tsé bighánílíní, which translates roughly to “where the water cuts through the rocks”. As part of the Navajo Nation, the canon is protected and accessible only via a guided tour group. Antelope Canyon is one of the most frequently photographed sites in the entire Southwest United States. The canyon was created by the erosion of rock layers, known as Navajo sandstone by geologists. Antelope Canyon is a major source of income for the Navajo nation and it sees many tourists all year around. While private tour companies have toured the canyon since 1987 it was only made available to tour by general your groups since 1997 when the canyon became an official Navajo Tribal Park. Despite the area’s popularity amongst photographers, photography in the canyon is quite difficult because of the narrow canyon walls and wide exposure range. The wide exposure range occurs because of the light that reflects off the canyon walls. As mentioned, Antelope Canyon was created by the slow erosion of Navajo Sandstone. Navajo sandstone is a specific geological formation found in the southwest part of the United States. Navajo Sandstone is found with the Glen Canyon Group, a geologic group that can be found throughout northern Arizona, northwest Colorado, southern Nevada, and Utah. Navajo Sandstone is found mainly in southern Utah and northern Arizona. In these regions, it forms many land masses, ridges, canyons, plateaus and natural monuments. Navajo sandstone is part of the Jurassic geologic formations, and it can be distinguished from surrounding Jurassic formations by its color. The color of Navajo sandstone is usually a white or a light pink color. The colors of Navajo sandstone are created by the presence of different minerals like limonite, hematite, goethite, and quartz. Depending on where the Navajo sandstone is located, it can have varying properties like porosity and permeability. The erosion happens mainly due to flash floods and subaerial erosion events. During the monsoon season, northern Arizona is prone to flash floods, and the water from heavy downpours drains into the large basin found above the slate canyon areas. This water begins to increase in speed and pick up large amounts of sand and silt as it rushes through corridors and passageways. The monsoon season is usually defined as a change of precipitation, or seasonal changes of atmospheric conditions that accompany the heating of sea and land. While the term monsoon is usually used to refer to a rainy period, it can also describe a dry period that occurs due to the change of atmospheric conditions. The monsoon season in the southwestern United States usually happens during July and August. Over many years the passageways erode which creates corridors even deeper and smoother, creating the canyon’s deep, flowing look. Flash floods are still a semi-frequent occurrence in the area, and in October of 2006, a flood struck the area that was so intense it lasted for 36 hours and forced park officials to restrict access to the lower part of the canyon for around five months. 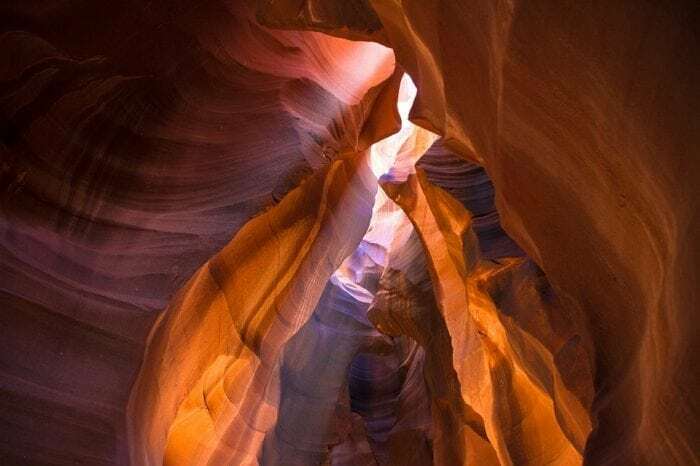 One of the reasons that Antelope Canyon is only open to visiting via guided tours is because flash floods can quickly overtake unaware travelers in the canyon. The geography of the surrounding area means that skies can be clear near the canyon itself, and rain falling dozens of kilometers or miles away collect in the plateau’s surrounding the canyon and then quickly flood the canyon. Some tourists were killed while visiting the canyon by a flash flood in 1997, and since then the Navajo Nation park authority has put more safeguards in place. Ladders and stairs have been bolted in place, alarm horns and weather radios have been installed in the region and cargo nets have been placed at the top of the canyon. The upper portion of the canyon is the portion that is most frequently toured, thanks in part to its uniform, ground-level, terrain. No climbing is necessary in the upper portion of the canyon. 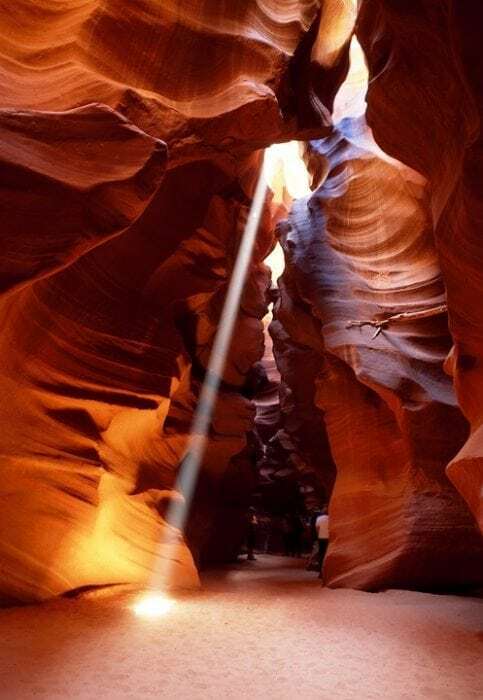 Beams of light coming in through the top of the canyon are also more common in the Upper Antelope Canyon, which is the desired sight for tourists and those looking to take photos. The beams of light can be seen most easily in the summer months when the sun is high in the sky for longer periods of time. Light beams tend to filter into the canyon between the end of March to the beginning of October every year. 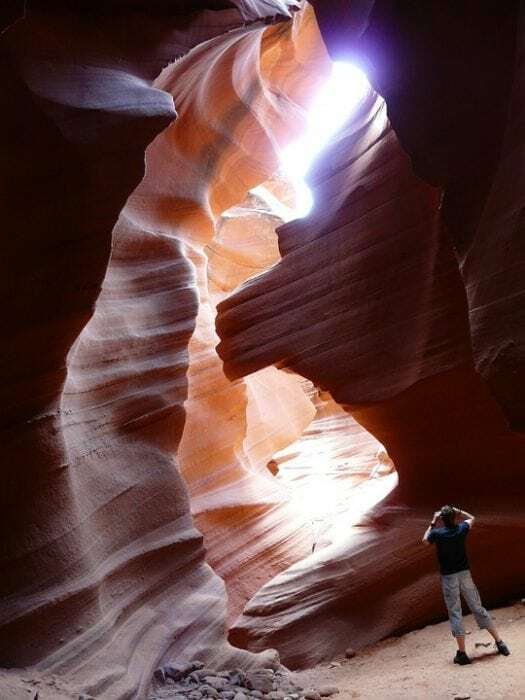 The Lower Antelope Canyon area is found a few kilometers from the upper canyon region and the area is more vertical, requiring more hiking and climbing. At a certain point, the installation of stairways and ladders was done, making the hike easier, though the hike is still much more strenuous than the Upper Antelope Canyon region. The Lower Antelope Canyon region is much longer and narrower in spots than the upper canyon. The climb out of the canyon at the far end is very vertical, utilizing several sets of stairs. The Lower Antelope Canyon still attracts its fair share of tourists and photographers, just not as many as the upper canyon. Tours marketed specifically at photographers are available and usually done around the middle of the day when the beams of lights filtering down through the top of the canyon are the strongest. While the Upper Canyon area is long and fairly straight, the lower canyon area is shaped like a “V” and quite a bit shallower than the other half of the canyon. The easiest way to visit Antelope Canyon is via the city of Page. The best time to go is probably from June to August, when the sun is directly overhead from around 11 AM to 1:30 PM as the beams of light are at their most prominent at this time.